In Germanic mythology, Wood Wives are forest-dwelling fairy women who are deeply attatched to the natural world. It was said that if one were to merely break a small branch from a tree, a Wood Wife would die. It was believed that these wild, magical women could bring blessing or misfortune upon a peasant household, depending on whether or not the family treated them and their domain with respect. It was a common practice on baking day to make an "extra loaf", to be left outside as an offering for the Wood Wives. This would bring good luck to the household. 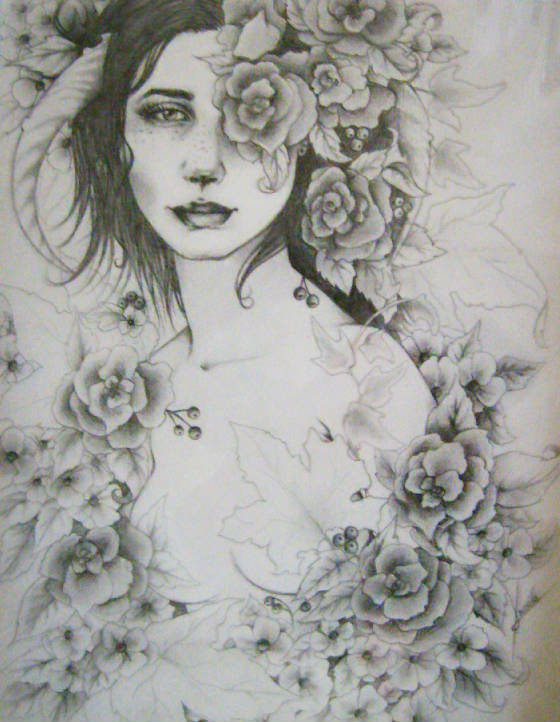 I worked on this drawing, on and off, over a fairly long period of time. The end result of this on-again-off-again effort is a freckled forest maiden completely surrounded by wild roses, meadowsweet flowers, and the leaves and fruits of the forest. She is depicted with horns to connect her to the Primal World.